The success of a pharmaco-treatment essentially depends on the availability of the drug at the site of action in the living body. 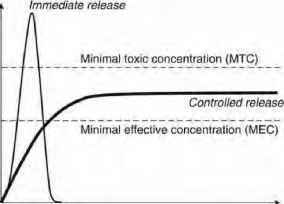 It is mandatory that the intact drug reaches its target site (e.g., a specific receptor in the central nervous system) and to an extent that concentrations greater than the minimal effective concentration (MEC) are provided. 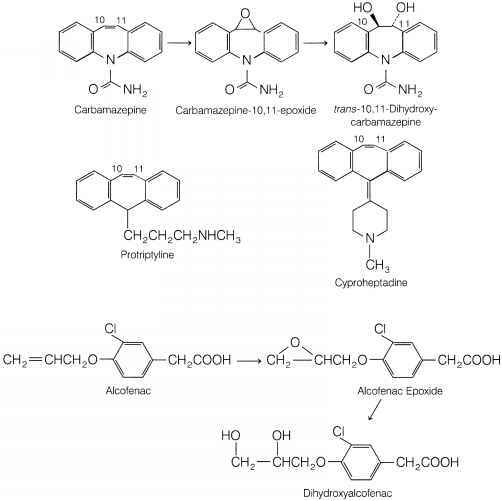 If these two prerequisites are not fulfilled, the therapy fails in vivo, even if the drug has an ideal chemical structure to allow for optimal interactions with the target structure and pharmacodynamic effects. Some of the potential reasons for the inability of a drug to reach its site of action are (i) poor aqueous solubility, (22) poor permeability across biological barriers, and (iii) rapid clearance out of the living body. In the first case, the drug remains at the site of administration or—in the case of oral administration—is not absorbed from the contents of the gastrointestinal tract (GIT). This is because only dissolved (individualized) drug molecules are able to diffuse and cross the major natural barriers in a living body (e.g., the GIT mucosa or blood-brain barrier). Poor permeability through biological barriers can, for example, be caused by a high molecular weight of the drug (hindering, for instance, diffusional mass transport), poor partitioning into the barrier (membrane), and/or effective efflux systems (e.g., P-glycoprotein pumps). Rapid drug inactivation can be due to fast drug metabolism and/or elimination and can also prevent many drugs from becoming active in vivo, despite of a great therapeutic potential. Furthermore, in various cases, the undesired side effects of a drug, caused in other parts of the living body, can be so severe that the administered dose must be limited, eventually to an extent that does not allow for therapeutic drug concentrations at the site of action. Also in these cases the therapy fails in vivo, since the drug is distributed throughout the living body, and not specifically delivered to the target site. To overcome these restrictions, an ideal drug delivery system should be able (1) to release the drug at a rate that perfectly matches the real need in vivo for the duration of the therapy, and (if) to deliver the drug exclusively to its target site. The term "controlled drug delivery" encompasses both aspects: time and spatial control of drug release. In this chapter, only time-controlled drug delivery systems are addressed; the reader is referred to chapter 9 of this volume ("Target-Oriented Drug Delivery Systems") for details on spatial-controlled drug delivery approaches. Figure 1 Schematic presentation of the "therapeutic window" of a drug and potential drug concentration-time profiles upon administration of oral immediate- and controlled-release dosage forms (thin and bold curve) (c denotes the drug concentration at the site of action in the living body, t the time after administration). are not optimal for all types of pharmaco-treatments. For instance, due to circadian fluctuations in certain hormone concentrations, daytime-dependent drug concentrations might be needed (chrono-pharmacology). 2. The reduction of the administration frequency of the drugs. This is particularly important for drugs with short in vivo half-lives. In the case of oral administration, for instance, a three to four times daily administration might be replaced by a once-daily administration only. In the case of parenteral administration, the injection of a drug solution every day might be replaced by a once a month injection of a suspension only. These simplifications of the administration schedule do not only help save time and financial resources, but most importantly, improve patient compliance. The inappropriate/inaccurate administration of many drugs still limits the success of various pharmacotherapies in practice. Many patients are elderly people with multiple, complicated drug treatments. 3. The simulation of nighttime dosing. Certain diseases require high drug concentrations at the site of action in the very early morning. For instance, the risk of asthma attacks is particularly elevated at this time of the day. Thus, the patient should wake up in the night and take a conventional dosage form to be protected in the very early morning. Alternatively, a controlled-release dosage form with a so-called "pulsatile" drug-release profile can be administered in the late evening, before going to bed. In the first part of the night, no drug is released, but after a predetermined lag time, the entire dose is rapidly released. 4. The simulation of multiple dosing of one or multiple drug(s). The combination of an immediate-release dosage form with a pulsatile drug delivery system, releasing the drug, for instance, six hours after swallowing, can provide two drug doses with only one administration. This again simplifies the administration schedule, which can significantly improve patient compliance. Furthermore, several different types of drugs might be combined and released at preprogrammed time points. 5. The development of novel drug therapies, which cannot be realized with immediate-release dosage forms. For instance, many drugs are not able to cross the blood-brain barrier due to limited passive diffusion and/or efficient efflux pumps (4,5). One possibility to overcome this restriction is to administer the drug dose directly into the brain tissue (intracranially). However, this type of administration includes a significant risk of serious infections, thus, frequent intracranial injections are not feasible. Using time-controlled drug delivery systems, a preprogrammed drug supply can be provided during several weeks or months, ideally reducing the number of administrations to only one. In the early drug discover phase, this type of advanced drug delivery systems can also be interesting to evaluate the potential of a novel drug candidate in animal models. If in vivo efficacy is shown, other strategies aiming at target-specific drug delivery across the blood-brain barrier might be envisaged. Thus, time-controlled drug delivery systems can provide fundamental advantages and significantly increase the therapeutic efficacy of a drug treatment. Time-controlled drug delivery systems can be classified according to different principles, for example, with respect to the route of administration, field of application, and/or underlying drug-release mechanisms. In this chapter, the various types of devices that have been described so far in literature have been classified based on the major physical/chemical phenomenon, which controls the resulting drug-release rate: diffusion, swelling, osmosis, degradation/erosion, and "others." However, it should be kept in mind that, in practice, often several of these processes are simultaneously involved in the control of drug release. Thus, this classification system should not be seen as very rigid. To be able to control the rate at which a drug leaves its dosage form, it is generally embedded within a polymeric (6-8) or lipidic material (9-11), which avoids immediate drug dissolution and release upon contact with aqueous body fluids. For parenteral administration, the matrix former is ideally biodegradable to avoid the necessity to remove empty remnants after drug exhaust. Upon administration of the device in vivo, the first step is often the wetting of the dosage form by water and subsequent water diffusion into the system. In the case of polymeric matrix formers, glassy-to-rubbery phase transitions with subsequent significant increases in the polymer chain and drug mobility might occur. Once the drug comes in contact with water, it dissolves (12), and the dissolved (individualized) drug molecules diffuse out of the dosage form. If the matrix former is a biodegradable polymer, the molecular weight of the macromolecules decreases with time, resulting in increased drug mobility. Also, the creation of water-filled pores (due to the dissolution of drug crystals and/or water-soluble excipients) can lead to time- and position-dependent drug diffusivities. In some systems, the involved mass-transport phenomena can be highly complex while others are relatively straightforward/mechanistically simple. If several physical/chemical phenomena are involved, their relative importance for the overall control of drug release might be very different. If, for instance, different processes occur in a sequence and one of them is much slower than all others, this process is dominant and the others can be neglected without introducing considerable errors. It is always highly desirable to know at least which major physical-chemical processes are involved in the control of drug release (13-15). Otherwise, if the dosage form is treated like a "black box," device optimization is generally cumbersome, requiring time- and cost-intensive series of trial-and-error experiments. In addition, trouble shooting during production can be challenging and the safety of the drug treatment might be questionable. In an ideal case, the underlying mass transport mechanisms are known and mathematical models available, allowing for quantitative predictions of the device design parameters (e.g., shape and composition) and environmental conditions (e.g., diseased state) on the resulting drug-release kinetics (16-19). Yet, there is a significant lack of mechanistic realistic mathematical theories allowing for a quantitative description of drug release within the dosage forms as well as of the subsequent drug transport within the living body to the target site (20).